The seaside town of Pilar de la Horadada is in the southern corner of Alicante region. 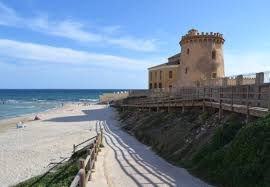 It is south of Alicante and close to the busy resort of Torrevieja. It lies on the border of Alicante and Murcia and was a battleground between the two kingdoms centuries ago. Nowadays it attracts tourists from around Spain and northern Europe who enjoy its fine, safe beaches and warm climate. The white sandy beaches contrast with the turquoise waters of the Mediterranean. Pilar soaks up more than 3,200 hours of sunshine a year. Pilar is a paradise for tourists with fine hotels, restaurants, bars and sports facilities. It is a popular place for sailing and water sport enthusiasts. There are also three golf courses within easy driving distance. Shoppers like to walk along the Mil Palmeras promenade with its stores and little boutiques. Those seeking livelier nightlife tend to go to Torrevieja for the evening, which is just 20 kilometres away and has an interesting mix of bars and discos. Pilar de la Horadada has excellent sports facilities at the municipal sports complex with tennis courts, football pitches, swimming pool, a skate park and a basketball area. There are several good golf courses nearby. The nearby Sierra Escalona has a large bird sanctuary. Birds of prey such as falcons, eagles, sparrowhawks and kestrels have been spotted in the area. Pilar de la Horada is close to Alicante and Murcia airports, which are both widely-used by budget airlines. It has good road links and is close to the picturesque Mar Menor and La Manga resorts. Pilar de la Horadada has a long and colourful history as you would expect from its position on the boundary between two warring kingdoms. This museum has many artefacts from the town and surrounding area and will take you on a short history of this interesting resort. The church is in the centre of town and is fairly modern although the bell tower from the original church still stands. Step inside for some fine examples of religious art including works by local artists José María Sánchez Lozano and Manuel Ribera Girona. Pilar de la Horadada was fought over between the two regions of Alicante and Murcia. The residents needed to watch out for marauding pirates or sneaky soldiers from across the border. 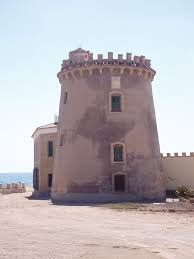 Watchtowers were built in the late 16th century and remained in use for more than 100 years. During Roman times, Pilar was an enclave called Thiare and was close to the 1,500-kilometre long road called the Via Augusta. The Romans exploited the quarry for the stone which may have been used to build this important road. Walkers have several good routes where they can stride out and enjoy Pilar's beaches and countryside. An easy walk to get you in the mood is from the coast to the main N332 road across the Rio Seco and through Mil Palmeras to the beach. Another pleasant coastal walk is from Torre de la Horadada to Campoamor. Pilar de la Horadada is surrounded by natural beauty and lush landscapes with a backdrop of mountains and tree-covered hills. You will also find sandy beaches and small coves with a rich and varied marine life. Pilar is close to both Alicante and Murcia airports, both of which are served by budget airlines. Pilar has a lovely sports complex where you can play football or go swimming for example. If you're looking for more nightlife, restaurants of theme parks, head up the road to Torrevieja.